Most Americans have no idea what is happening in the financial system. They have seen the ‘For Sale’ signs stacking up at the corner of their neighborhood intersections, but generally they are unaware that for every foreclosure there is an equal or greater loss in the banking system. Bankers and brokers are experiencing cognitive dissonance or as Wikipedia explains "the filtering of information that conflicts with what you already believe, in an effort to ignore that information and reinforce your beliefs." Without loans and leverage the market is expecting bankers to price assets at cash value. It is as if you woke up one morning and paper cash was the only medium of exchange. No credit cards, loans or mortgages. How much is that house really worth? A few of the "big men" such as Treasury Secretary Paulson are attempting to coordinate private sector bank bailouts, but these schemes (because they are unprecedented) are instead awaking investors to a new reality. While the bank stocks have sold off considerably (the BKX index is hitting new lows, down 20%), the broad indexes have held up surprisingly well. The best description of the mood we have seen so far is ‘panicky resilience.’ With tax receipts already at recession levels and consumers down to their last credit option (the expensive credit card), the asset fire sale should begin shortly. In our view the stock market is a sideshow, it can adjust to the economic reality very quickly as it did in 1929 (especially with credit losses already in place). In an article published over a year ago, we described the two crashes of 1929 and 1930. It appears we have begun the 1930-33 debt blowout/financial institution insolvency crisis before we incur significant stock market index losses. Fortunately credit derivatives have been clear in their warning. Stock market investors are ignoring the crashing real estate market and the trillions of debt that cannot be repaid. So who are the investors that continue to ignore the problems that are evident by just driving through a U.S. neighborhood? Investors from Europe, Asia, and the Middle East are buying U.S. stocks in record amounts. As market timers, foreign purchases make excellent contrarian indicators. 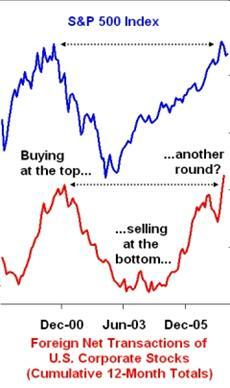 As the chart below from Financial Armageddon states, foreigners are buying stocks at greater levels than in 2000. On January 3rd 2001, the Federal Reserve announced a surprise 50 basis rate cut. The NASDAQ rose 14% that day. After a three month rally, the S&P 500 subsequently fell 34% over the next year and half. It's interesting to see the option market activity also mirror 2001. As Morgan Stanley reports "option protection" is at the highest price ever, breaking the old July 2001 record. The credit bubble is global and has fueled a rise in almost all assets (especially illiquid and complex financial agreements between financial institutions). However when debts come due, cash is needed. 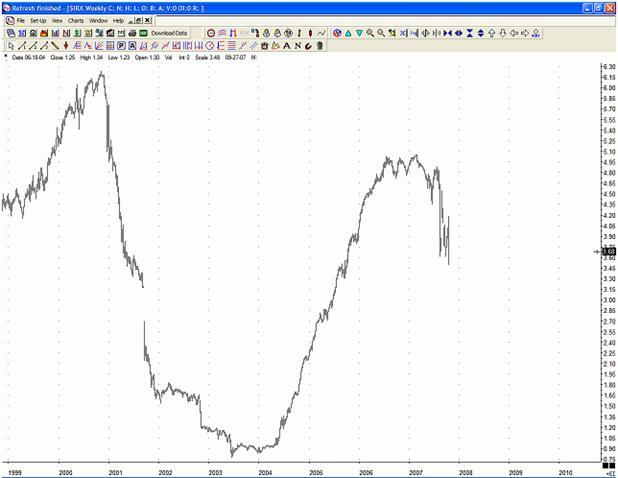 Therefore the impact of the credit crunch is best represented in the chart below of the three month Treasury Bill Yield (Yahoo symbol:^IRX). Our first discussion of Structured Investment Vehicles (SIVs) last month proved to be well timed, as the focus of Wall Street has turned to these losses with the creation of the Master-Liquidity Enhancement Conduit (a private sector bailout fund). Remember SIVs are off-balance sheet entities, which sell short term loans in the commercial paper market to finance the purchase of long term assets (mortgages). Now that foreclosures are reducing the value of these mortgages, the SIVs are holding large losses. In some cases, investors are not getting paid back. Regulators are also forcing the SIV assets to be valued at current market prices (unlike derivatives where values are based on house estimates). So instead of realizing losses and creating a fire sale, the banks have created the M-LEC fund to purchase the assets from the SIVs presumably at higher than market prices. In reality, they are just shuffling losses around trying to buy time. As Joseph Mason, a Drexel professor states "Continuing to mask transparency by means of rearranging risk without actually offloading or recognizing the true value of that risk is not going to help anyone." Economist Nouriel Roubini also brings up a good point: "there is a second collective action problem: if there is no rescue plan each individual SIV would want to be the first one to sell its assets to get the best price for them." On October 18th, two European SIVs were already forced to sell assets. How important is the SIV issue? According to Bloomberg, SIVs hold $320B worth of assets. Returning to the ABX.HE credit derivative indexes which aided our analysis in May, mortgages created since 2006 rated A or lower are currently priced at a 30% loss or greater. If a mortgage was created in the first half of 2007, it is valued at 26% or less (yes AAA). What this shows is first this isn’t just a ‘subprime’ problem. Secondly, you can see losses are already present (no wonder they want a bailout fund!). In a special report from Risk.net, SIVs are described as “usually leveraged 12 to 16 times.” ‘SIV-lites’, though fewer in number, leverage 40 to 70 times! As we described in Global Mania Deflating, as asset prices fall: “leverage begins to work in reverse. Investors sell, as their debts now exceed their holdings.” A couple ‘SIV-lite’ funds have already gone under. So far using short term financing Citigroup’s SIVs have been able to “stave off a fire sale.” But the mortgage loans are still hitting new lows and are forcing the issue. As we stated in May, "In a crisis, a financial institution’s capital cannot be separated from a hedge fund arm, proprietary trading desk or prime brokerage unit." It's time to add SIVs to that list. (Just in case more skeletons come out of the closet, let's add "any pool of money lent out that is associated with or originated from a bank.") We can't pick out one set of losses and state they are going to be more important to depositors and investors. As Moody's Corp. explains "Banks have reputations to protect...the blow to a bank's reputation that may be occasioned by a failure of a SIV (Ed note: Or any pool tied to a bank's name!) may be more than the bank can tolerate." It's all about the emotion of trust. For instance, when it was revealed that Northern Rock was seeking emergency lending from the Bank of England, British depositors rushed to withdraw their funds. One depositor explained: "It is just a colossal shock. I don't think I'll ever trust the banking system in this country again, and I'm very tempted to do what my mother-in-law used to do, and stick it under the mattress!" Here in the U.S. this has already happened with Deutsche Bank, Citigroup, Bank of America, J.P. Morgan Chase, and Wachovia (all tapped the emergency Fed discount window as discussed in August). Barclays and the Royal Bank of Scotland have also recently joined the party. But other than a one day run at Countrywide (it too was experiencing funding problems and received a loan from Bank of America) we have had no bank runs yet. Eventually nerves will become frayed and the herding impulse that was on display over the last few years in the buying of real estate will be directed in a new way: the rush to remove funds from a weak institution. History suggests that this will lead to bank closings. Everyone should have in physical possession at least two months of expenses in cash that will allow them to operate if extended bank holidays are enacted. Also don’t forget to get a little extra for dependents, whether younger or older. 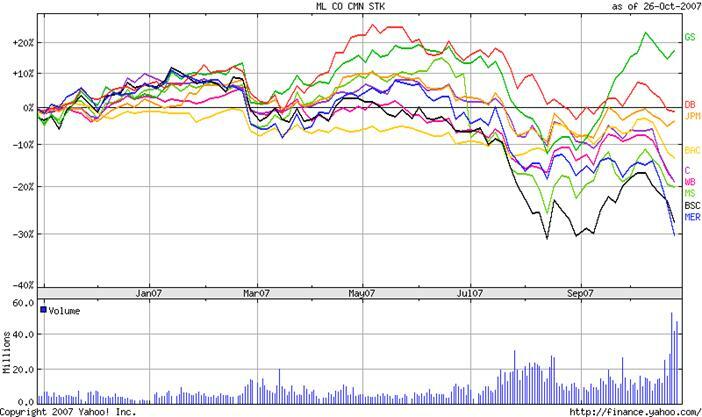 To see how the banks stand as of now, we have created a chart comparing stock price over the last year. Merrill Lynch has recently taken the lead from Bear Stearns with the ousting of its CEO. Stock prices can change very quickly (as can depositor perception), so we do not recommend holding funds at any of these institutions. We were surprised at the extent of Merrill's credit losses in comparison to its rivals. Since the beginning of the year, they have been correctly warning of the inevitable credit crunch. "In his July memo, Mr. O’Neal (Ed Note: ex-CEO of Merrill Lynch) said the bank was aware of the risks and had taken precautions against them.’ Over the last six months,' the memo said, 'we have worked successfully to position ourselves for a more difficult market for CDO’s and been proactively executing market strategies to significantly reduce our risk exposure. '” Soon after Merrill stated it would write down losses of $4.5B, which shortly ballooned into $7.9B, with analysts estimating more losses in the future. How could Merrill ignore its own warning? In last month's article describing bridge loan risks for publicly traded financial institutions we warned, "With no ownership, investment bankers have made their fees and jumped ship." It appears this conclusion applies here as well. As the New York Times reports: "The fact that the fixed-income unit has been a revolving door of management and the reality that Mr. Kim (Ed Note: head of investment banking), while perhaps sharing responsibility, left before the problems surfaced." This is why we strongly encourage investors to hold funds at well capitalized private firms without investment banking departments. Mr. O'Neal was subsequently ousted as CEO of Merrill Lynch by the board of directors. They were especially upset with his phone call to Wachovia. This is extremely damaging to Merrill Lynch's reputation as an attempt at a merger is seen as a need for a bailout and an indication that they have much larger losses. It is also rattling other credit markets from municipal bond markets to corporate default derivatives. As BusinessWeek warns: "the systemic risk is that investors will be forced to sell off higher-rated assets to cover bad bets on assets with lower ratings—indeed, in its bombshell news this week, Merrill Lynch warned it could not guarantee against such a risk." We are not surprised at some fellow bear’s insistence that we are headed for stagflation. Martin Weiss relates his father's experience in the early 1930's: "I asked some of my business friends WHY they were selling the bonds. They talked about 'inflation coming back,' about the danger of 'reflation,' as they called it." Long term interest rates will rise not because of inflation but from the fear of default as we explained in June. He continues: "True, the pace of deflation had slowed temporarily. 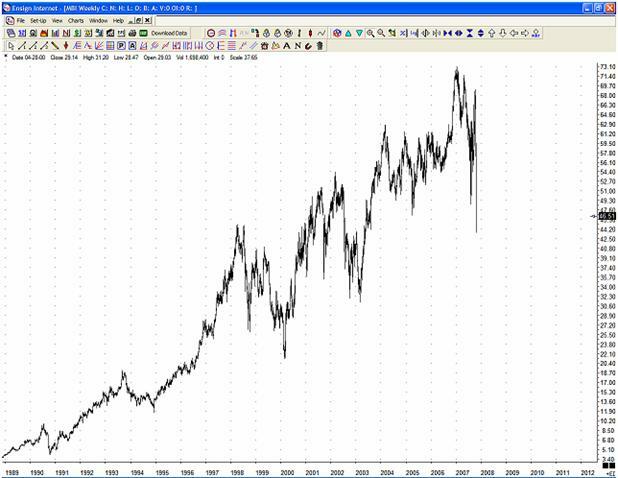 And true, some commodity prices were jumping. But later, I realized that most of the inflation talk was just an excuse. The main reason they sold the bonds was because they were afraid they were going to get stuck with huge losses. Or because they needed the money....Investors feared that any company -- regardless of their rating -- could go belly up, and they were right! At some companies, finances deteriorated so quickly that, by the time the analysts got around to downgrading them, it was too late." We expect to see massive dumping of long term bonds. No matter what country or investor sells, the higher yields will put further pressure on folks trying to pay their adjustable rate mortgage. "As the credit crunch hit hard in the third quarter, most banks were forced to cut back their lending. But one group of banks increased lending by an incredible $182 billion. Who were these deep-pocketed lenders? The lenders in question were the 12 Federal Home Loan Banks, set up under a government charter during the Great Depression to provide support to the housing market by advancing funds to over 8000 member banks that make mortgages. In the third quarter, loans to member banks, also called 'advances," totaled $822 billion, a 28% leap from $640 billion at the end of June." As Margaret Thatcher reportedly said: "you can't buck the market." On Oct 10th, the Federal Home Loan Bank of Chicago was restricted from paying its cash out for its stock, due to the weakening of its own financial health. So even New Deal quasi-government institutions which were created to prevent a Depression are now unable to continue lending without sparking a run on their capital. Below is a chart of MBIA which has lost roughly 40% since the beginning of this year. As an insurer of financial products, it is on the hook for guarantees backing credit default swaps, mortgage backed securities, and asset-backed securities. "Spreads widened significantly across the market in the third quarter and caused our insured credit derivatives portfolio to generate a large `mark-to-market' (Ed. Note: current market price!) loss, which we do not believe accurately reflects the economics of our business. The `mark-to-market' loss is not an actual loss, nor is it indicative of future claims. We remain comfortable that our insured credit derivatives portfolio will not result in material credit losses." So the CEO believes that the current market price is wrong and is more comfortable using numbers he believes are more accurate. As you can see from the chart, he has so far been unsuccessful in convincing shareholders that recent stock performance is “not an actual loss.” Why is this company important to the average investor? MBIA also provides guarantees for ‘conservative’ securities such as municipal bonds, investor-owned utility bonds, and public project bonds. According to a June article in Barron's: "MBIA has $6.8 billion in statutory or insurance-company-level capital, plus unallocated reserves of $200 million, to protect its total guaranteed portfolio of $635 billion in par value against loss." According to Bloomberg, MBIA disclosed it had insured $114B in CDOs (remember rainy day fund $7B). It is interesting to see financial institutions defend their portfolios by stating they have only ‘AAA’ CDOs. In the current environment, ratings are changing quickly. If MBIA were to have problems, CDOs which ‘AAA’ rating depends on MBIA’s insurance would be quickly downgraded. Guarantees are only as good as the funding behind them. According to the Daily Sentiment Index operated by MBH Commodities the number of traders who are U.S. dollar bulls has dropped to 9%. Inversely, gold is registering 93% bulls with even the more conservative MarketVane survey registering 92% gold bulls. So what does this mean? Jim Rogers, the most vocal dollar bear, who recently moved to Asia and shifted some of his assets into the Yuan, is now admitting that “probably the dollar is going to have a big rally about now because everybody in the world is short the dollar.” He explains: “In my experience in the investment markets, when everybody’s on one side of the boat, you’d better think about going to the other side for a while.” We believe that as the asset fire sale continues, credit will contract and the U.S. dollar will be in high demand. Remember cash is already rising against real estate. Gold, which has been touted by ‘bears’, has recently behaved like a leveraged stock market trade. As Robert Prechter first observed, its rise has been propelled by the liquidity in the system. According to the COT report speculators (hedge funds) are holding a net long position, while commercial hedgers are short. Without hedge fund leverage, what is the true value of gold? We expect a lot less than the current price.